Here at Britsuperstore we are committed to delivering a great service to you our customers, which is why we have worked hard to develop relationships with a number of leading postage companies to offer you a range of delivery services. Each company has different calculations in working out their postage rates so that you can choose the best postage option. To help you choose the best shipping option for you, we have created the Shipping Estimator. After you place your first item in your basket, you will be taken to the checkout area. In the Checkout area you will find the Shipping Price box. 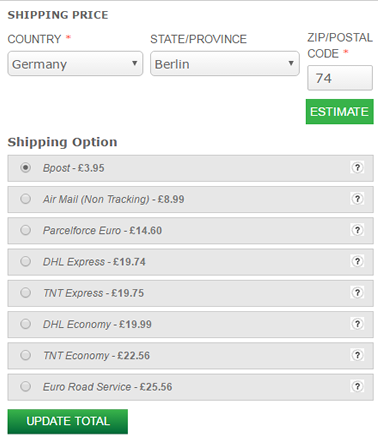 In the Shipping Price box, simply select your Country, Province/State and Zip/Postal code. You will then be given an estimated shipping price for the weight of your parcel from a number of shipping companies. You are now free to continue shopping. While you continue shopping you will notice a change at the top of the screen. You will now see a blue/yellow bar and a product display bar. The Product Display Bar gives you a running reminder of the items you have chosen with the option to add to the quantities of the products by using your mouse. The blue/yellow bar shows your cheapest shipping option. The yellow portion of the bar shows how much a customer can add to their package before a shipping price increase occurs. The example below shows a yellow current shipping bar which shows a price of 3.95 and that 58% of their weight allowance for that price has been used, leaving 42% of their weight allowance to be used at no extra shipping costs. We hope you have found this guide helpful and we look forward to receiving your order.